Joshua D. Keith booking photo (Courtesy: Cache County Jail). LOGAN — Deputies have arrested a second suspect believed to be involved in the explosion last week that resulted in the evacuation of several Providence homes. Joshua D. Keith was booked into the Cache County Jail Friday night. The 22-year-old Providence man is being held without bail after a judge issued a warrant for his arrest Friday afternoon. 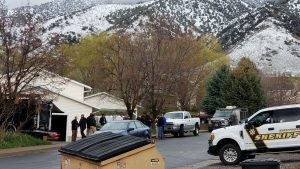 The Cache County Attorney’s Office has charged Keith with two counts of recklessness involving an incendiary device, a second-degree felony; and, reckless endangerment, a class A misdemeanor. FBI agents and Cache County Sheriff deputies outside a Providence home near 450 East 125 North, where an explosion Tuesday night sent a man to the hospital with shrapnel wounds. Deputies learned of the explosion after Keith was driven to Logan Regional Hospital with shrapnel wounds to his stomach, hands and face. His friend, Jeffrey Toombs, told investigators that the two men were manufacturing a “homemade blasting cap” inside Toombs’ garage when the device unintentionally detonated. When investigators arrived at Toombs’ home, near 435 East 125 North, they found a bottle of tan colored substance. It was later determined to be Hexamethylene triperoxide diamine (HMTD), a high explosive organic compound. Toombs told deputies that the two men bought the explosive compound in Salt Lake. He explained that Keith was packing the HMTD into spent rifle cartridge casings, when one of the casings exploded. Toombs was arrested Wednesday night and is also being held without bail. He was arraigned in 1st District Court Thursday on similar charges. Keith was hospitalized Tuesday night and underwent emergency surgery. He was released from the hospital shortly before being taken into custody. Keith is expected to be arraigned in 1st District Court Monday afternoon.